Website and processes: 4 Feb 16 D & D , 5/5 Excellent "So incredibly helpful, we cannot wait to fly!" 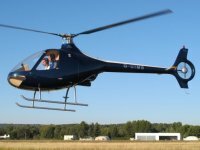 During the flight you will take the controls of the aircraft and learn how to perform the basic manoeuvres of a helicopter. When you arrive you will be given a flight briefing explaining what you will be doing during your lesson. You will then go out to the helicopter and be shown the different parts to the aircraft. You will then take a seat and take off for your lesson. Upon completion you can ask any question about your flight and the possible future of your flying training. The maximum weight for the participant is 100kg. Although spectators will not be able to join the voucher holder on the lesson, there are viewing areas where they can watch the take-off and landing. The airport has a cafe which can be used by spectators during the lesson. !